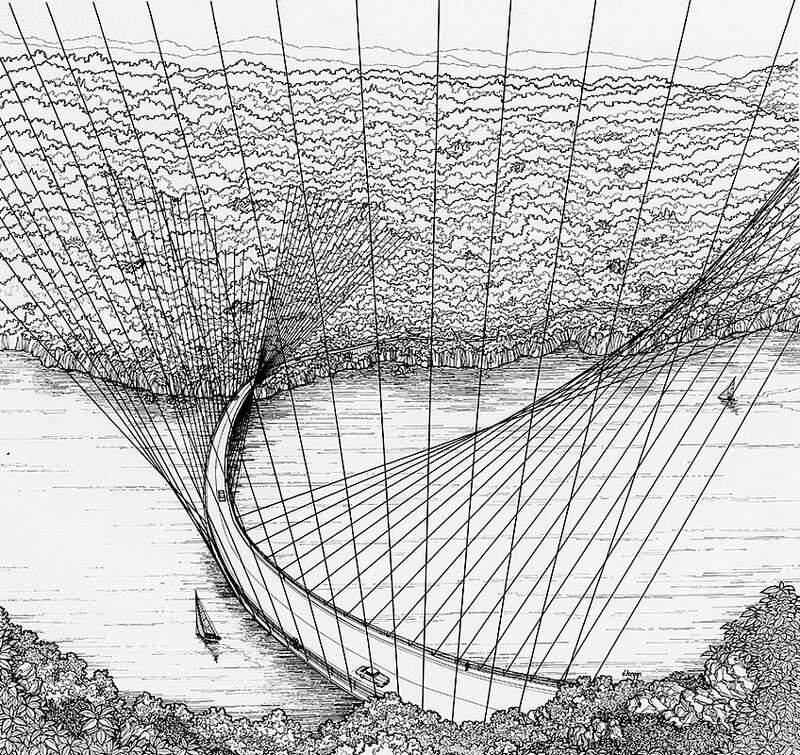 I was reading a book, "AAD - Algorithm-Aided Design" by Arturo Tedeschi and on the last page was a computer generated drawing for a 'Cloud Bridge.' This picture reminded me of the many other lovely bridge designs that were never built because they were too whimsical or too expensive. For instance, the Ruck-A-Chucky Bridge was designed by TY Lin when he was working at Skidmore, Owings, and Merrill. It was to go across the Middle Fork of the American River (in California) when the state was planning to built the Auburn Dam in the 1970s. 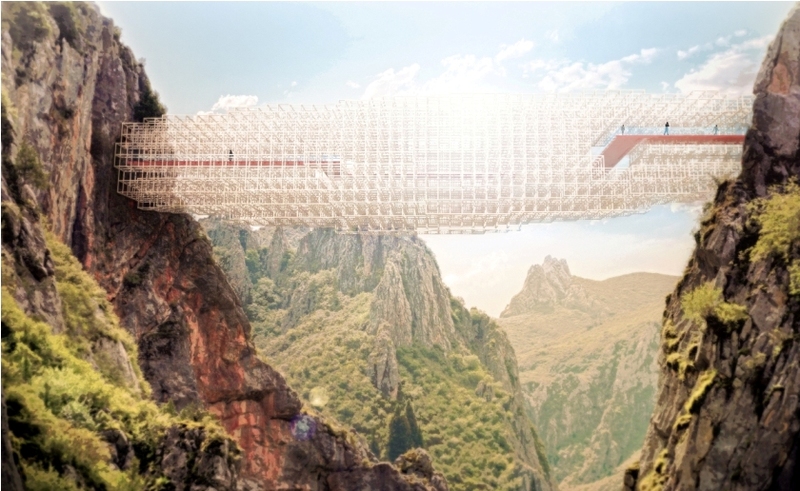 Because the bridge was to be built in a steep canyon, it was thought that a curved superstructure hanging from cables anchored into the rocks above would be an economical alternative with the least environmental impact to the area. When it was decided not to build the dam, they also decided to abandon the bridge project. Similarly, Frank Lloyd Wright had been interested in designing a bay crossing between the San Francisco to Oakland Bay Bridge and the San Mateo to Hayward Bay Bridge. His first drawings were made in 1949. The design had an sinuous, organic shape with 2000 ft long arch spans supporting a garden in the middle of the Bay. It was called the 'Butterfly Bridge,' perhaps because it resembled the flight of a butterfly. Several attempts were made to finance this 'Southern Crossing' but the state of California eventually rejected the idea as being too costly. There are many other designs for bridges that were never built because they were perceived to be impractical for some reason. It seems like if you have a nice hand for drawing landscapes or for doing 3D computer graphics you can create something intriguing, but it requires something more to get your design built. We'll take a look at some more unbuilt bridge designs in my next post.